Each year washing dishes using an ENERGY STAR®certified dishwasher rather than washing them by hand, can reduce your utility bill by about $40 and save you 230 hours of personal time to use for other endeavors. On average, an ENERGY STAR® certified dishwasher is 5 percent more energy efficient and 15 percent more water efficient than standard models. It may come as a surprise that washing a load of dishes in the dishwasher uses less water than doing the same number of dishes by hand. (Dishwashers also do a better job of killing germs, because they use hotter water than you would normally use if washing by hand.) For each cycle, an ENERGY STAR® certified dishwasher model uses about 4 gallons of water; a non-certified model uses about 6 gallons. You can see the expected lifetime energy savings of an ENERGY STAR® certified dishwasher by clicking on the Appliance Savings Calculator link under Resources then choosing dishwashers from the appliance categories located at the bottom of the page. You can save even more on utility costs by choosing a dishwasher with its own heating element. All ENERGY STAR® certified dishwashers have built-in booster heaters, which can raise the temperature of the water used in the machine to 140º F, thereby allowing for improved disinfection compared to hand washing. This means you can lower your household water heater thermostat to an energy-saving 120º F—a temperature adequate for the needs of most families. 1. Choose the right size for your home. The standard model is 24-inches wide. Compact models are about 18-inches wide and hold fewer dishes. There are also drawer-style units that allow for washing a small load in one drawer or a full load in both. Keep in mind that operating a smaller-capacity dishwasher more frequently may use more energy than running a larger-capacity unit less frequently. 2. Choose a model with an ENERGY STAR® label. As indicated earlier, an ENERGY STAR® certified dishwasher uses at least 5 percent less energy and 15 percent less water compared with other models. 3. Compare the yellow EnergyGuide label across models. 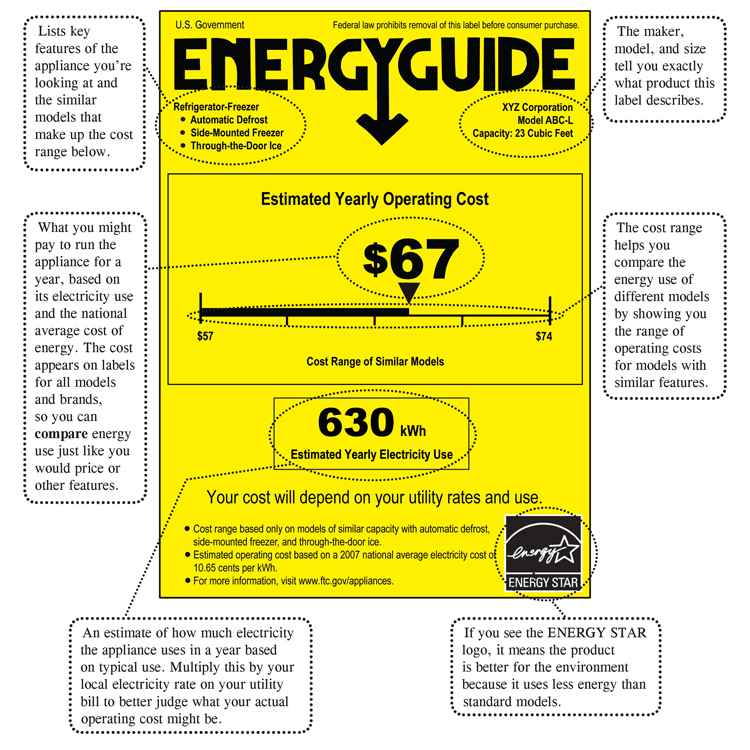 A yellow EnergyGuide label includes information on the annual energy consumption and operating cost. Compare labels of similar models. Energy Factor (EF) is a measure of the overall energy efficiency of an appliance. The higher the EF, the more energy efficient the dishwasher. For a dishwasher, EF measures the electricity used to operate the dishwasher and the energy consumed to heat the water. Though the EF is not listed on the EnergyGuide label, it along with the average cycles per year and the average cost of energy are used to calculate the energy and cost estimates for each model. Effective January 20, 2012, the ENERGY STAR® criterion for a standard-sized dishwasher is ≤ 295 kWh/year and ≤ 4.25 gallons per cycle. Dishwashers that meet these criteria will have an ENERGY STAR® label in addition to the EnergyGuide label. Figure 1 is an example of an EnergyGuide label for a refrigerator-freezer. Figure 1. Look for the yellow EnergyGuide label and know how to read the information it provides. Credit: U.S. Federal Trade Commission. 4. Choose a model with energy and water saving features. Choose a model with features that save more energy and water, including several wash cycle selections, a soil sensor, and a built-in booster heater. Also, see if the dishwasher allows you to choose between heat-drying and air-drying. Heat-drying elements use a considerable amount of energy; circulation fans for air-drying use very little. Below are some tips on operating your dishwasher to maximize energy and water savings, as suggested by ENERGY STAR® and the Iowa Energy Center. Avoid unnecessary pre-rinsing. Pre-rinsing dishes before loading the dishwasher can use up to 20 gallons of water. ENERGY STAR® certified dishwashers and detergents are designed to clean without pre-rinsing. Scrape plates with a rubber spatula rather than pre-rinsing, so as not to waste water. Soaking or pre-washing is usually recommended only if food is burned-on or dried-on. You may use your dishwasher’s rinse feature instead of soaking or pre-washing since it uses a fraction of the water needed to hand rinse. Try to operate the dishwasher only when it is fully loaded, rather than doing several loads with only a few dishes, because the machine uses about the same amount of water during each cycle regardless of the number of dishes being washed. Don’t overload your dishwasher, and match the cycle to the load. For most loads, the normal setting will work best, but choose the cycle depending on the load and level of soil. Although it is best to operate a dishwasher with a full load, make sure not to overload, so that all items are exposed to the water spray and nothing interferes with the spray arms or water jets. Clean the dishwasher following the manufacturer’s instructions. By cleaning your dishwasher regularly according to manufacturer’s directions, you can expect optimal cleaning. If your dishwasher doesn’t have a self-cleaning filter, regularly remove the filter and clean out trapped food particles according to the manufacturer’s instructions. Also, clean the spray-arm nozzle and water jet in order to maximize the power of the water flow necessary to clean dishes. Air-dry dishes. Don’t use the heat-dry option; instead, use the no-heat option, or open the dishwasher door after the final rinse to let dishes air-dry. When opening the door right after the rinse, watch out for escaping steam. Also, if high humidity is a problem in your home, do not open the dishwasher door to air-dry your dishes. Porter, W. A., Ruppert, K. C., Cantrell, R. A. & Lee, H. 2015. Energy Efficient Homes: Water Heaters. Ruppert, K. C., Porter, W. A., Cantrell, R. A., Lee, H. & Prescott, T. 2015. Energy Efficient Homes: Appliances in General. U.S. Environmental Protective Agency. June 2013. Consumer Messaging Guide for ENERGY STAR® Qualified Appliances. U.S. Environmental Protective Agency: ENERGY STAR®. Dishwashers for Consumers. First published May 2009. Revised May 2015.